SALT LAKE CITY (KSTU) -- Investigators are trying to figure out what started a large house fire in Salt Lake City late Wednesday night. 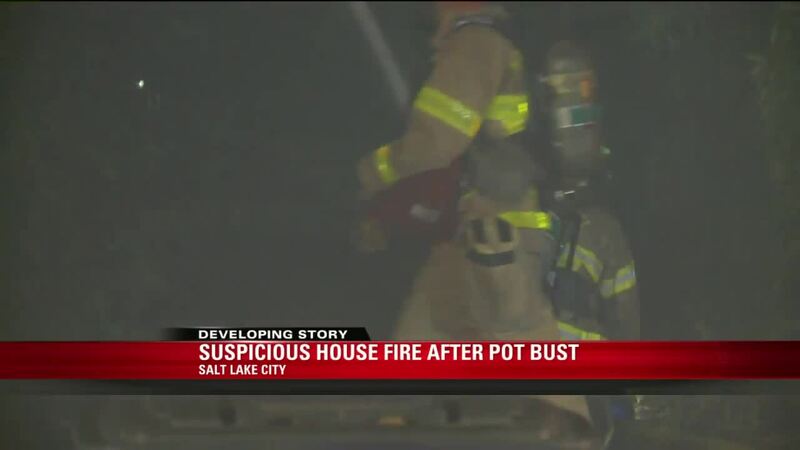 Earlier this week, the same house was busted for a marijuana grow. It took a team of roughly 45 firefighters to battle the flames at 264 South and 1000 East. The first call came in just after 10 p.m., but because of concerns that the structure was unstable crews fought the fire defensively into the early morning hours. This is the same house where detectives served a search warrant Tuesday for a marijuana grow. Police say 70 plants were seized from the backyard as well as approximately 4 pounds of dried marijuana from inside the home. That resulted in the arrest of 39-year-old Nathaniel Harris, who was booked into jail for production of a clandestine lab. Court documents indicate Harris admitted to owning the plants, and growing them. The flames destroyed a detached garage, but didn't damage any other homes. The fire department says nobody was injured in the fire.